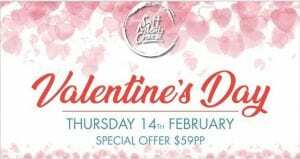 Celebrate Valentine’s Day the Italian way with a three course dinner at Salt Meats Cheese Surfers Paradise on Thursday February 14. The indulgent dinner includes an antipasto platter to share, your choice of pizza and pasta for the main and a decadent dessert for $59 per person (with a Prosecco on arrival!). Book now for you and your lover.